The common etiologies presenting with central diabetes insipidus (DI) associated with a thickened pituitary stalk in the pediatric population are: Langerhans Cell Histiocytosis (LCH), central nervous system tumors such as germinoma and craniopharyngioma, granulomatous lesions like tuberculosis and sarcoidosis and autoimmune disorders like lymphocytic infundibuloneurohypophysitis. A 4-year-old male child presented with excessive urine output and increased frequency of micturition. He had complaints of increased thirst and fluid intake for 6 months. There was no history of trauma, autoimmunity and tuberculosis, joint pain and deformity. DI was confirmed with water deprivation test and decreased random urine osmolality value of 77.00 mosm/kg (normal serum osmolality: 295.00 mosm/kg). Urine specific gravity was 1.005. Magnetic resonance imaging (MRI) showed a uniformly thickened pituitary stalk that enhanced on contrast administration. There was no other cranial pathology detected. All investigations performed to rule out the common causes for DI with a thickened pituitary stalk in pediatric population were within normal limits. These tests included chest radiograph, complete hemogram, erythrocyte sedimentation rate, serum electrolytes, blood sugar, and glycosylated hemoglobin and were within the normal range. The anti-diuretic hormone (ADH) level was 0.30 pg/mL and was in the subnormal range. The serum human chorionic gonadotrophin (hCG), acetylcholine esterase (ACE) and 1,25(OH) 2 vitamin D 3 were within normal limits. Antinuclear antibody and antipituitary antibodies were negative. The anterior pituitary hormonal profile included cortisol 18.0 μg/dL, adrenocorticotrophic hormone (ACTH) 45.6 pg/mL, tri-iodothyronine (T3) 142.0 μg/dL, tetra-iodothyronine (T4) 8.2 μg/dL, thyroid stimulating hormone (TSH) 3.15 μIU/mL, growth hormone (GH) 0.7 ng/mL and prolactin 27.0 ng/mL. Lumbar cerebrospinal fluid (CSF) cytology was normal and CSF ACE and HCG were negative. In spite of extensive investigations, no definitive etiology for the central DI and thickened infundibulum could be established, and hence the patient was kept under regular follow-up. Repeated neurological and ophthalmological examinations were performed to detect progression of the disease. The DI was treated medically with nasal desmopressin spray and the clinical response was immediate with decrease in urine output and resolution of nocturnal enuresis. After 6 months, the child developed a left scalp swelling. At this stage, he had no history of fever, lethargy, skin eruptions or weight loss and examination did not reveal any lymphadenopathy and hepatosplenomegaly. The computed tomography (CT) scan of the brain showed two punched out lytic lesions in the skull with soft tissue swelling [Figure 1]. MRI brain showed a persistent thickened pituitary stalk in addition to confirming CT findings [Figure 2]. 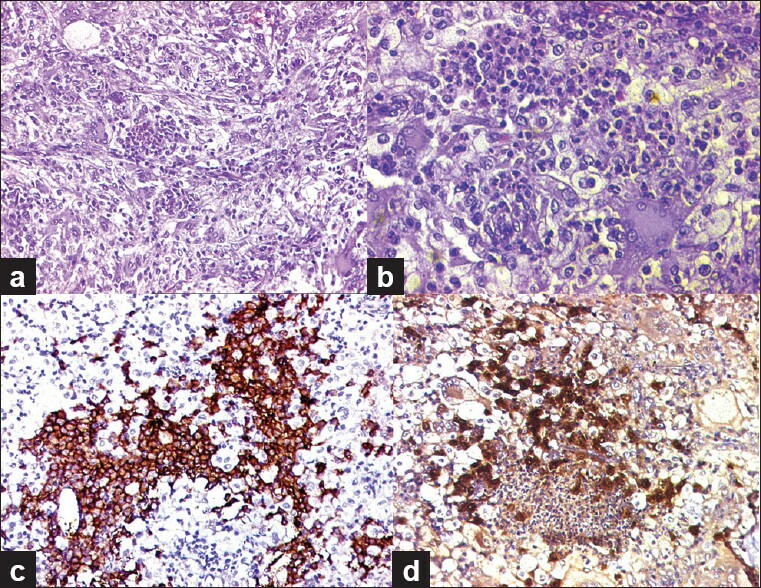 Histological examination of biopsy of the skull lesion revealed the tumor to consist of malignant tumor cells arranged as plump spindles and giant multinucleate cells [Figure 3]. Inflammatory cells including eosinophils were seen between the tumor cells. Immunohistochemistry (IHC) demonstrated the tumor cell positivity for CD1a and S-100. The histology was diagnostic of LCH. A bone scan using Tc99m MDP injection showed osteolytic lesion in left parietal bone and osteoblastic lesions in both the frontal bones suggesting skull involvement, but no evidence of osteoblastic lesion was seen in rest of the skeletal system. Bone marrow aspiration showed normocellular areas with trilineage hematopoiesis, no increase in blasts and no granulomas. Liver biopsy showed no infiltration of liver by LCH. His chest X-ray was clear and skeletal survey did not show any other lesion. After confirming the diagnosis and extent of disease, the child was planned for chemotherapy according to LCH protocol. The patient was given six cycles of initial treatment of injection vinblastin at a dosage of 6 mg/m 2 at an interval of 1 week for each cycle. The continuation treatment consisted of injection vinblastin at the same dosage every third week and tablet omnacortil at a dosage of 40 mg/m 2 from day 1 to day 5 every third week and tablet 6-mercaptopurine (MP) at a dosage of 50 mg/m 2 on all days except Sundays for a total duration of 12 months including the initial treatment. Central DI with thickening of the pituitary stalk on MRI may result from various infiltrative diseases. Although 50% of the cases are idiopathic, other most common causes include LCH, central nervous system tumors such as germinoma and craniopharyngioma, granulomatous lesions like tuberculosis and sarcoidosis and autoimmune disorders like lymphocytic infundibuloneurohypophysitis. To determine the precise etiology on the basis of MRI findings is a difficult task and barely 35% of the cases are diagnosed on serial imaging studies, which is a significant increase from 15% diagnosed on first imaging. Germinomas are rapidly evolving tumors associated with deficiency of anterior pituitary hormones; thus, serial scans elicit their diagnosis. 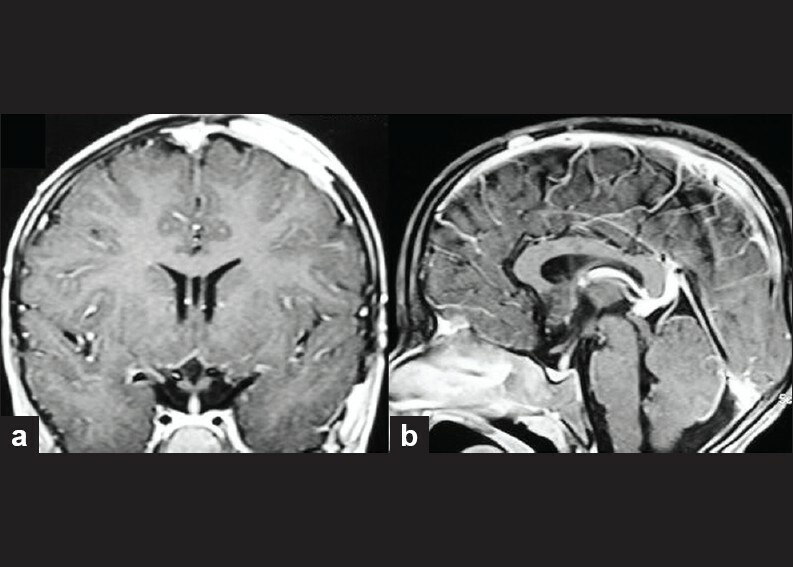 Lymphocytic infundibuloneurohypophysitis has been seen to be associated with vasopressin-cell autoantibodies and other organ specific autoimmunity and some of these cases may also show spontaneous resolution of pituitary stalk thickening. Since the etiological diagnosis of central DI with thickening of the pituitary stalk may not be apparent at the time of detection of DI, serial imaging and close follow-up of these patients to reach a conclusive diagnosis is necessary and mandatory to avoid the attendant risks of pituitary stalk biopsy. DI may occur before, simultaneously and after the other multisystem manifestations, making the diagnosis difficult in the initial stages, as seen in our case. Radiological manifestations of the disease include thickening of pituitary stalk more than 3 mm, with loss of physiological hyperintense signal in posterior pituitary on T1W images signifying loss of ADH storage granules. This may progress to a mass lesion involving pituitary and hypothalamus. Besides tumorous lesion, the second most common radiological manifestation is pathological changes in the cerebellum, basal ganglia and pons with hyperintense signals on T2WI and hyper- or hypointense signals on T1WI images. The treatment of LCH is challenging and a single modality of treatment has not been established. DI is usually permanent and requires lifelong nasal vasopressin. An active lesion is treated by chemotherapy. Although radiation is not the treatment of choice, it may be used as an alternative. A complete clinical resolution is unusual. For tumorous lesions, surgery, radiation or standard LCH chemotherapy may be employed. The optimal management for neurodegenerative lesions is not established. 1. Prayer D, Grois N, Prosch H, Gadner H, Barkovich AJ. MR imaging presentation of intracranial disease associated with Langerhans cell histiocytosis. 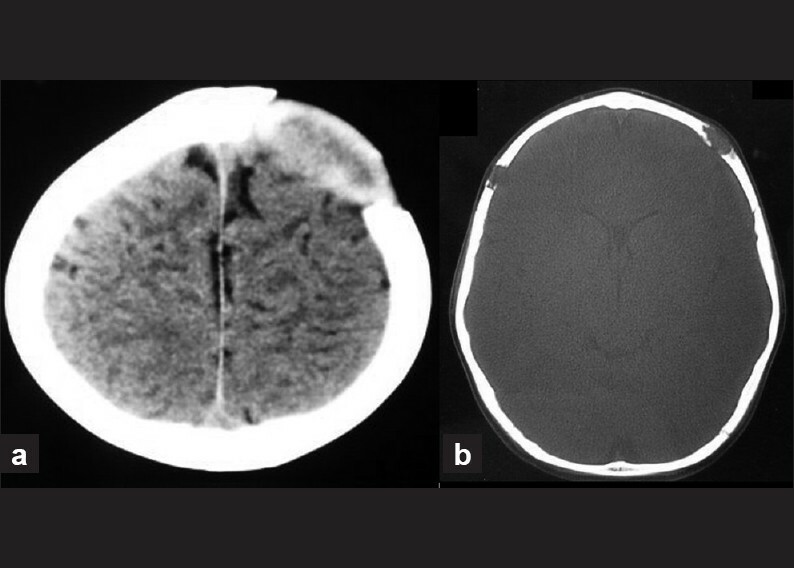 AJNR Am J Neuroradiol 2004;25:880-91. 2. Leger J, Velasquez A, Garel C, Hassan M, Czernichow P. Thickened pituitary stalk on magnetic resonance imaging in children with central diabetes insipidus. J Clin Endocrinol Metab 1999;84:1954-60. 3. Kramer TR, Noecker RJ, Miller JM, Clark LC. Langerhans cell histiocytosis with orbital involvement. Am J Ophthalmol 1997;124:814-24. 4. Hoover KB, Rosenthal DI, Mankin H. Langerhans cell histiocytosis. Skeletal Radiol 2007;36:95-104. 5. Nanduri VR, Bareille P, Pritchard J, Stanhope R. Growth and endocrine disorders in multisystem Langerhans' cell histiocytosis. Clin Endocrinol (Oxf) 2000;53:509-15. 6. Grois N, Flucher-Wolfram B, Heitger A, Mostbeck GH, Hofmann J, Gadner H. Diabetes insipidus in Langerhans cell histiocytosis: Results from the DAL-HX 83 study. Med Pediatr Oncol 1995;24:248-56. 7. Saatci I, Baskan O, Haliloglu M, Aydingoz U. Cerebellar and basal ganglion involvement in Langerhans cell histiocytosis. Neuroradiology 1999;41:443-6. 8. Arana E, Martí-Bonmati L. CT and MR imaging of focal calvarial lesions. AJR Am J Roentgenol 1999;172:1683-8. 9. Tien R, Kucharczyk J, Kucharczyk W. MR imaging of the brain in patients with diabetes insipidus. AJNR Am J Neuroradiol 1991;12:533-42. 10. Grois N, Prayer D, Prosch H, Lassmann H; CNS LCH Co-operative Group. Neuropathology of CNS disease in Langerhans cell histiocytosis. Brain 2005;128:829-38.